In a departure from the classic typefaces we have been exploring recently, this week we will examine a much more contemporary typeface: Georgia. In 1993, Microsoft commissioned the design of Georgia, along with sans serif typeface Verdana, so they could provide typefaces that could be more easily read on computer screens. Verdana was originally more popular, owing to its clarity and digital legibility. However, as screen technology became more advanced and society developed a renewed interest in vintage designs, Georgia’s popularity has greatly increased. In 2006, a New York Times article declared that Georgia was the “most fashionable” typeface of the internet. The typeface has enjoyed continued popularity since, both onscreen and in print. 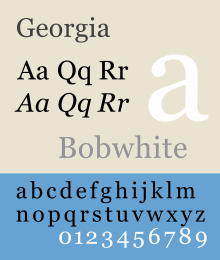 Georgia was designed by Matthew Carter, who was trained in metal typeface design and had already created Bell Centennial for phone books and ITC Charter, specifically for low-resolution printed materials. In order to adapt the typeface for digital viewing, Carter increased the x-height (height of the “x” and other comparable letters, in relation to capital letters). The spacing between letters is wider and the letters themselves are bigger than, for example, Times New Roman characters at the same font size. The serifs are more horizontal and wider than those of Times New Roman. The numerals are text (old style) numerals, with certain numbers dipping below the baseline, in part to avoid confusion with other numerals and letters and increase readability. Georgia was used as the official logo and in all marketing materials for the 1996 Olympic games, and is one of the most utilized fonts on the internet, particularly for online publications. Georgia is featured on websites for the Guardian, the Washington Post, and the Wall Street Journal, among many others. Even the New York Times now uses Georgia on its website, instead of Times New Roman. And, last but not least, the font was evidently named after a tabloid headline “Alien Heads Found in Georgia.” How could you resist?